For long, a demand from Chocolatieurs had been the need for controlling the speed of the conching process, and we listened. 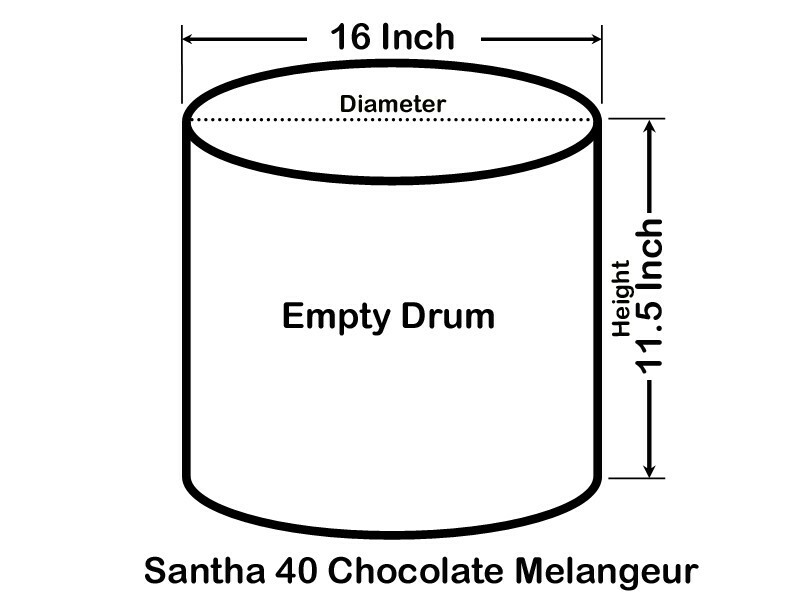 An electronic speed controller unit in Santha 40 Chocolate Melangeur is flexible to control the speed of the drum rotation varied from zero to full speed, and simultaneously also allows for the unit to be used worldwide. This 40 lbs capacity machine is the great companion to enterprise. The typical Titling feature makes it unnecessary to have to lift the vessel or drum to pour out the contents. This amazing stone melangeur is the perfect companion to your endeavor. We have made several key enhancements to the stone grinder to make it perfect for Chocolate, nut butters, Mexican masa, cosmetics and other food processing. Our stone melangeurs can be used to make Marcepan from almond, Mesa from corn, coconut paste, Gianduja from hazel nuts, Pistachio and cashew butters, Tahini from sesame seeds, flax seeds paste, Sphagnum moss for facials, Hummus from boiled chick peas, rice batter from rice, Quinoa and many an other grinding application. Yes, we are shipping through DHL Express delivery. This is delivered to your home door step. Santha 40 is specially designed to grind cacao and nut to get smooth butter and creame chocolate. Santha 40 is having Hard Black Granite cylindrical stone rotates over the hard black Granite stone base drum. 5. What is grinding capacity of Santha 40? The Capacity of Santha 40 is 40Lbs. 6. What is the maximum running time of Santha 40? Usually, Santha 40 runs upto 24Hours. Since Cacao grinding, nut butter process are hard to grind, Santha 40 is designed for this purpose of continuous grinding to get the smooth and soft chocolate and nut butter. 7. What is function of Santha 40? Santha 40 is a 220 Voltage single phase table top Chocolate Grinder in cherry red colour, grinding capacity is about 40. Approximately the net weight is about 150Kgs. 9. Do I need any additional Attachment?